The traditional Igbo wedding ceremony is called Igba Nkwu Nwanyi, which means wine carrying. In Igbo land, Igba Nkwu Nwanyi is usually incredible and breathtaking because Igbo traditions are one of the most interesting. Igba Nkwu Nwanyi concludes the entire marriage deal that has started with the groom asking for the bride’s hand. All the friends, relatives, colleagues, even neighbours come together to congratulate the newly wedded. After the date for the official wine carrying has been set, the ceremony is done at the bride’s home and her family prepares a large feast (depending on their pockets) for the groom’s family coming and invited guests, they also hire a live band and maybe traditional dancers to make the ceremony interesting. Usually, the bride-to-be is dressed in the traditional Igbo wedding attire which include a blouse, a double wrapper, a red coral bead necklace and a big head tie known as ‘Ichafu’ or a bead round her head. The groom is expected to be accompanied by a larger party this time (friends included) and bring along with him the bride price list. He must present the list along with the required gifts to the Umunna before the ceremony begins. The highlight of Igba Nkwu Nwanyi is when the bride in public points out the man she wants to marry. in future, then he gives her a cup of palm wine (it is usually placed in a gourd) to find the man she intends to spend the rest of her life with. The bride along with her maidens then goes to find her groom who is hidden in the crowd, as she searches for him with the wine in her hand; she is beckoned by other men and the groom’s friends seated in the crowd to give them her wine. After searching him out, she then offers him the drink in her hand kneeling down. 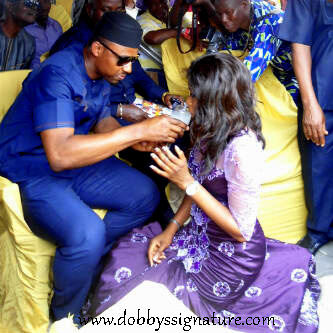 If he takes a sip, it signifies to the crowd that he is her husband, acceptance means they are officially man and wife. The groom and bride then dance to meet her parents who then pronounce blessings on them. The merriment begins and the couple is given gifts by friends and family. Idu Uno comes immediately after Igba Nkwu, at this stage; the bride visits the groom’s home for the first time and she goes along with a maiden or her sister who isn’t married to keep her company. Before she begins her journey, the bride’s family gifts her with items she’ll need to start her new home, these include cooking utensils, bed-sheets, suitcases, boxes, sewing machine, bed, pillowcases, plates, clothes and other essential things she’ll need to begin their new life together. The bride’s sister or family can go back home after a few days to give feedback to her people.